Jonesboro is the seat of Craighead County in northeast Arkansas. Located west of the Arkansas Delta, Jonesboro has been shaped more by rice and manufacturing than cotton farming. Although Jonesboro is known as the “city of churches,” the town has had a Jewish community and synagogue for well over a century. While the settlement that grew to become Jonesboro was established around 1860, Jews did not arrive until after the railroad reached the area in 1881. Rudolph Meyer was one of the first Jews to settle in town. After peddling in the vicinity for a while, he opened a dry goods store that eventually developed into the largest department store in Jonesboro. By 1903, his store, The Grand Leader, had more than 21,000 square feet of floor space. His brother Max later joined him in Jonesboro, opening a store of his own. Max Meyer also owned a rice farm. Marcus Berger was another pioneer of the Jonesboro Jewish community. He came to the United States from Austria-Hungary in 1865 at the age of 21. He moved to Jonesboro in 1883 to open a retail store. He also had a wholesale supply business. Although there was no Jewish congregation in Jonesboro during his early years in town, Berger would close his store for Rosh Hashanah. Berger would later play a leading role in creating a synagogue in Jonesboro. Maintaining Jewish traditions could be a challenge in Jonesboro. Nathan Blecker arrived in town in 1890 and opened a dry goods store. An observant Jew, Blecker struggled to maintain his Orthodox practice. He later moved his family to Memphis so they could be a part of that city’s large Orthodox community. Blecker remained in Arkansas to manage his businesses, only seeing his family on the weekends. ​From the earliest days of the Jonesboro Jewish community, there was a split between Reform and Orthodox Jews. Reform Jews had prayed together informally for a few years before they formed Temple Israel in 1896. Soon after it was founded, Temple Israel joined the Union of American Hebrew Congregations, to which it still belongs today. Orthodox Jews prayed informally amongst themselves as well. The Orthodox group, which never officially formed a congregation, was meeting as early as 1892, and held services for the high holidays at the Masonic Hall until 1927. Orthodox Jews from such nearby towns as Monette, Trumann, and Manila would travel to Jonesboro for Yom Kippur and Rosh Hashanah. Since they only met twice a year, Jonesboro’s Orthodox Jews never felt the need to create a formal congregation. Several members of the Orthodox group belonged to Temple Israel. After 1927, the remaining contingent joined the temple. Disputes over religious practice did not cease with the merger of the Reform and Orthodox groups. One congregation member, Lewis Sachs, was shocked by the temple’s policy of allowing non-Jewish spouses to be buried in the Jewish cemetery. He then purchased a plot of land right next to the Temple Israel cemetery for use as an Orthodox cemetery. Only nine people were ever buried in the Orthodox cemetery: Lewis Sachs and eight of his family members. It did not take Jonesboro’s Reform Jews long to build a home for their congregation. In 1897, Temple Israel bought land for a synagogue. They dedicated Jonesboro’s first synagogue in January of 1898; the congregation had about twenty families, representing over eighty Jews. Of these founding members, almost seventy-five percent were foreign-born, mostly from Germany and Austria. The small congregation's ability to construct a synagogue refelcted the affluence of its most prominent members. Congregants like Marcus Berger, who employed three live-in servants in 1900, must have offered significant financial support to the congregation. In addition to their new synagogue, Temple Israel was able to support a full-time rabbi for twenty-five years. Isaac Rubenstein was the congregation’s first spiritual leader, serving from 1897 until his untimely death in 1899, when he became the first person buried in Jonesboro’s Jewish cemetery. After 1922, Temple Israel was no longer employed a full-time rabbi. For several decades, they brought down student rabbis from Hebrew Union College in Cincinnati. From 1936 to 1942, and from 1947 to 1954, the rabbi at the Blytheville congregation would drive to Jonesboro twice a month to lead services. While men were the officeholders and board members of Temple Israel, the Sisterhood played a very important role. In the 1920s, when the congregation had no rabbi and faced financial hardship due to declining membership and building repair costs, the Sisterhood took the lead in responding to the crisis. They raised money, paid for the synagogue repairs, and contracted with Hebrew Union College to get student rabbis. They sold the parsonage the congregation had built in its early years to pay off the debt. The Sisterhood was also in charge of running the religious school, which had twenty-four students in 1917. The congregation was revitalized by the newly formed Arkansas Jewish Assembly in the 1930s. Jonesboro Jews continued to concentrate in retail trade during the first half of the twentieth century. Joseph Heinemann started out as a peddler and eventually got a job working for Rudolph Meyer at his Grand Leader store. In 1914, Heinemann opened his own business, which became the biggest department store in Jonesboro. In 1937, Heinemann’s Department Store employed forty-five people. Brothers Emil and Jake Less owned a clothing store that specialized in high quality merchandise made in New York. Moses Stonefield and his son Ben owned a grocery store, while Morris Berger opened a successful furniture store with a Gentile partner. After World War II, a few Jonesboro Jews helped to develop the town’s industrial economy. Harry Albertstein was born in Jonesboro, but moved to St. Louis as a small child. He came back to Jonesboro after the war to open a shoe factory. The company, called Frolic Footwear, was the first large-scale manufacturing plant in the city. At its peak, it employed 1,800 people in Jonesboro and at other plants in nearby towns. In 1951, Albertstein created the Frolic All-Stars, an amateur basketball team that traveled the region in a nine-passenger DeSoto playing against semi-pro and college teams. The success of the team brought great renown to Jonesboro. While Albertstein sold the company to Wolverine in 1970, Frolic helped pave the way for a number of other ventures which transformed Jonesboro into a regional industrial center. Abe and Joe Blindman came to Jonesboro from Minneapolis in 1954 to open a factory that made wooden soft drink cases. They ran the Southern Wooden Box Company along with their brother-in-law Sam Levitt. By the 1960s, their operation employed over 200 people. The Blindman brothers became important civic leaders in town, and found much less anti-Semitism in Jonesboro than they had experienced in Minnesota. Unlike in Minneapolis, they were welcomed into the Jonesboro country club. Indeed, by all accounts, Jews were very well accepted and socially integrated in Jonesboro. Each year, Temple Israel held interfaith services with local churches. The Jewish population of Jonesboro has fluctuated over the twentieth century. It dropped significantly during the 1920s and 1930s. While 125 Jews had lived in town in 1905, only sixty-eight still did in 1937. After World War II, Jonesboro experienced economic growth as it became a manufacturing center. Temple Israel’s membership grew as well. In 1959, they decided to build a larger synagogue, and sold their old building to the First Baptist Church. 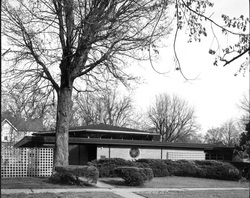 In October of 1960, they dedicated their new synagogue, which was almost twice as large as their old building in anticipation of future growth. The congregation attracted members from small towns in the area, including Paragould, Lake City, Marked Tree, Corning, and even a few towns in southern Missouri. Temple Israel's building was built in expectation of a larger congregation, but, unfortunately, this growth has not occurred. In the early-twenty-first century, Temple Israel's membership declined to approximately twenty households. As in so many communities, Jewish-owned retail stores died out by the 1980s. Most of Temple Israel’s members are now professionals, especially doctors and college professors; Jonesboro is a regional medical center and the home of Arkansas State University. Temple Israel continued to bring in student rabbis until 1999, when they hired a retired rabbi from Pennsylvania, Alan Weitzman, to lead High Holiday services.